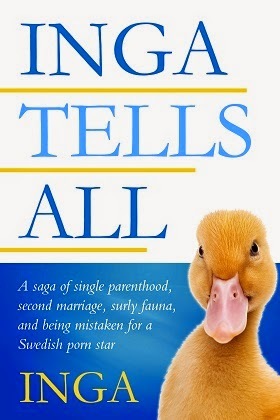 Inga: Who'd Be A Mother? Leaving a 75% tip after your toddler throws up in the antipasti plate at the upscale Italian restaurant. Buying an entire display of out-of-season organic tomatoes after your five-year-old pokes holes in them with a caramel apple stick. Taking an entire afternoon off work to sort through several hundred totally disgusting lunch bags in the dumpster at your child’s elementary school to find the $200 retainer he accidentally threw out that you, as a single mom, cannot afford to replace. You go to brush your teeth and find the toothpaste, minus the top, floating in the toilet. Your three-year-old, who has serious speech problems secondary to hearing issues, tells people that when he grows up, he wants to be a “f—k diver” (truck driver). Your 4-year-old announces he wants to be pregnant for Halloween. Your five-year-old spray paints every inch of his three-year-old brother silver. Pediatrician recommends soaking child in bathtub in “several gallons” of baby oil (which come in 15-ounce containers). You buy out the entire baby oil stock of five drug stores, silver three-year-old in tow. Your pre-teen sons and their two tweener cousins draw pubic hair on female cousin’s Barbie doll sparking International Incident. Your non-athletic child is playing goal in youth soccer. When the other team comes charging down the field with the ball, he has his back to the field and his fingers hopelessly entangled in the net. Goal is scored, game is lost, other parents query loudly why “some kids” are on the team. Your kids get you an extra-large wine glass engraved with “Mom” for Christmas. You don’t want to confess to your college-bound son that Mom’s “secret” chocolate chip cookie recipe all those years was Pillsbury Slice n’ Bake. During final exam week at college, your son ignores an oil leak under his car which ultimately ignites in the unseasonably hot weather, burning his car and the one next to it in the parking lot to the ground. It also melts the asphalt underneath. It never occurred to you to buy asphalt insurance.